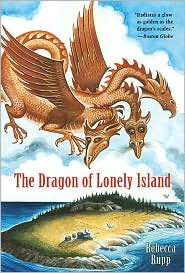 What serendipity to read Rebecca Rupp's marvelous book The Dragon of Lonely Island so soon after reading Grace Lin's magical dragon story Where the Mountain Meets the Moon. Although the two books are wildly different in terms of characters, plot and setting, they do share one common, wonderful detail. Both books incorporate storytelling into their plots. In Where the Mountain Meets the Moon, storytelling is a tradition that prompts Minli to begin her adventure. In The Dragon of Lonely Island the storytelling is the adventure. Siblings Hannah, Zachary and Sarah Emily Davis find themselves spending the summer at their great-great aunt Mehitable's house on Lonely Island. Enclosed in a letter to their mother, Aunt Mehitable sends the children the key to to the Tower Room in the house on Lonely Island and a note that reads, "If you should find time hanging on your hands, try exploring Drake's Hill." The children discover the mysteries of the Tower Room and Drake's hill pretty quickly. First they find that Aunt Mehitable spent her childhood on the island and has left a treasure hidden in the Tower Room then they learn how the rocky hill on the island got it's name. Following Aunt Mehitable's advice, the children make a bee-line for Drake's Hill where, after a bit of rock climbing, they find the cave that is home to Fafnyr Goldenwings, a tri-drake. This three headed dragon, for which only one head is awake at a time, has chosen the cave on Lonely Island as a Resting Place. With a measured, erudite manner, a bit like the dragon in Kenneth Grahame's The Reluctant Dragon, Fafnyr welcomes the children into his cave, calms their fears and disperses their misguided fairy-tale notions about dragons. As a way of soothing them, he tells them a story. The story that Fafnyr First Awake (the honorary name given to the head of the dragon that wakes first and begins to crack the shell of the dragon egg) is set in Ancient China and is about a young girl named Mei-lan. Although he is really telling a story about himself, Fafnyr does not reveal this to the children. Yet, the story he tells relates to the children and their immediate life experiences. As the First Awake, Fafnyr sympathizes with Hannah, the oldest of the siblings, and the the responsibilities that sometimes weigh on a first born. At the end of his story the sleepy dragon tells the children that he needs his rest and to please keep their meeting a secret. Upon their next visit to the cave, the children meet a different Fafnyr, a brother with a fondness for the sea who tells them the story of Jamie the orphaned cabin boy and his adventures with pirates and treasure. Again, Fafnyr's story relates to the children and a squabble over a flashlight they had been having. Finally, the children meet the Last Awake Fafnyr, the sister, who tells them the story of a little girl who was afraid to try new things. In the end, the children realize that Fafnyr is telling the story of Aunt Mahitable, how she met Fafnyr and how the tri-drake came to choose Lonely Island as it's Resting Place. A delightful ending to a short and sweet book, makes The Dragon of Lonely Island a perfect bed-time read-out-loud for non-readers and an excellent fantasy for a reader ready to move on from Junie B Jones and The Magic Tree House. Though short in length and mystery, Rupp includes enough magical details, like a puzzle box, a dragon scale and a bond with Fafnyr that leaves permanent golden drop in the palm of one's hand, to make her book and alluring story that readers will love. 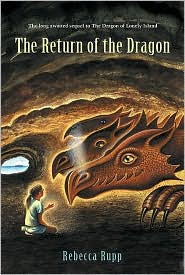 Rebecca Rupp sequel, The Return of the Dragon, finds the Davis siblings back on the island while their parents are travel to London. Entrusted with the responsibility of keeping Fafnyr Goldenwing's existence a secret, the children find they have a fight on their hands when a billionaire docks his yacht on Lonely Island to do some "bird watching." This one's been a favourite at our house for years, and we've read it many times...the sequel too, although we discovered it later. The original's got a folksy warmth to it, and any danger or tension is mostly contained in the stories-within-the-story, which softens them. You're right -- fine bedtime stories. I have two kids into dragons. Thanks for the recommendations!